Art House Hostel - Polyanka i Moskva, Rusland: Reservér nu! 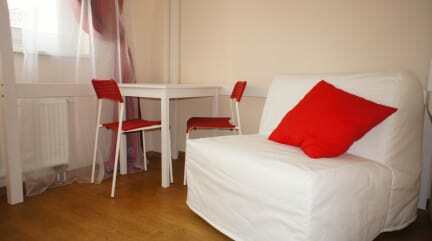 Art House Hostel on Polyanka is located in the center of Moscow just 5 minutes walk from the Polyanka Metro Station. The hostel is close to Tretyakov Gallery, Gorky Park, Park of Arts Museon, a large number of theaters, restaurants, cafes and shops. The Moscow Kremlin and Red Square can be reached on foot in 15 minutes (1 metro station). This is big hostel which provides several double rooms, three 6-bed rooms with air-conditioning, two 8-bed rooms, two 10-bed rooms and one 12-bed rooms. All rooms are decorated in fresh and bright colors, have curtains and high ceilings. Beds are wooden, bright and with soft high mattress for convenient of guests. We provide decent atmosphere in our rooms and common areas in order to make every guest feel like home. We offer taxi transfer from/to main Moscow airports and train station. Our guests can order transfer in advance via e-mail. Approximate price for taxi from Airport is around 1500 roubles. For our foreign guests we offer Visa Support. Cancellation policy: 0 hours before arrival. Due to Russian Law we ask every guests to bring their Passports or ID with them.